I’m going to start this series of posts with a common complaint car drivers have of motorcycles. Filtering is when a motorcycle cuts between cars that are stopped (usually at a light) in order to get to the front. This is different from (and often confused with) splitting which is when they do the same thing but when cars are moving. The laws governing filtering vary from state to state, country to country. In Perth, Australia, where I now live, it is legal but you have to do it in a specific way. I’m not going to go into all that. Instead, I’ll tackle the whys. When I lived in Los Angeles, I remember having a conversation with someone (I think it was my wife) about filtering. A motorcycle went by as I was stuck in traffic (a common occurrence in LA) and I lamented that I hated when they did that. Probably said something about how it was against the law (though I clearly had no idea if that was true). The response was that it was legal because motorcyclists that sit in the fumes of the exhaust of the cars could get dizzy/lightheaded and they needed to be able to keep moving. That made sense to me so from that moment on, I stopped complaining about it and tried to keep out of the way of motorcyclists filtering next to me. Now that I’ve been on a motorcycle for a while, I can tell you that, while the above reason is true, it is not the most important one. When you are on a motorcycle, you are really out in the elements. That helmet might look tight, but it certainly isn’t keeping out any of the smells. When I am riding behind you, even at 35 mph, I can tell if you are smoking and if it is a cigarette, clove, pipe, cigar, or something illegal. I can tell you what the restaurants are cooking, how much the air temperature changes from block to block, and much more. Sitting in traffic, especially behind a truck or other vehicle with lots of exhaust, can be an absolutely nauseating experience. The fumes are nearly unbearable for any length of time. On top of that, on a motorcycle you are sitting on the engine. The air-conditioning (or temperature control) is movement. On a hot day, you are practically cooking while you are sitting. While some motorcyclists feel comfortable in shorts and a t-shirt, I’m pretty attached to my skin so I always wear protection. And protection is hot. Fine for winter, but terrible for summer. Sitting in traffic is a quick path to heat exhaustion. But the most important reason, and the only one that justifies filtering in my mind, is safety. People in cars don’t see motorcycles. Around here, they call it the SMIDSY defense. Sorry Mate, I Didn’t See You. 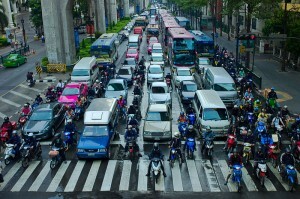 Filtering gets you to the front of the stopped traffic where a motorcycle is easily seen. Motorcycles, even the under-powered overweight ones, will have no problems keeping to the front of traffic so they won’t be slowing anyone down. This forces the cars behind to see the motorcycle and reduces the chance that someone will merge into you trying to get five feet farther up the road. So, why do motorcycles filter? To reduce the chance that they’ll die because a driver didn’t see them. The problems arise when motorists mistakenly think that they should take the law into their own hands and stop lane filtering. In this report done by the Office of Transportation and Safety in California, 7% of drivers admitted to actively trying to stop splitting. That’s splitting, not filtering. Splitting is when both vehicles are moving. The only way to stop that is to ram the motorcycle (or at least threaten to). Note – in California, it is legal to both split and filter. While the reasons for splitting are similar to those for filtering, I, personally, have never felt it necessary. Of course, Perth traffic isn’t in the same league as LA. But, with 7% of the drivers willing to freely admit to a surveyor that they attempted vehicular manslaughter, those aren’t odds I like. Good idea for a series of posts, Tom. Though I don’t ride a motorcycle myself, I do recognize that there are several differences between operating a bike vs. a car, and most drivers are totally unaware. I’ve understood the reasoning behind it, but I still have issues with it. For one thing, the roads in Metro Vancouver are narrow, highly congested, and totally inadequate for our population at this point. We have the worst congestion in all of Canada, and are second worst to only LA in all of North America. But at least they have wide roads down there! Here, when a motorcyclists filter or split lanes, they’re truly taking their lives into their own hands. Narrow lanes mean there isn’t really safe room for splitting. We have insane laws that allow parking on our busiest streets almost all day (we only restrict it 3 hours out of the day, and it’s barely enforced, so everyone just parks during those hours anyway). So a 3 lane road here is really a zero lane road, because lane 1 is parking, lane 2 is people stopping every 5 seconds to try and park, and lane 3 is people turning left because we don’t restrict left turns anywhere either! We also pretty much allow trucks and semis to go on our busiest roads as well because we don’t provide trucking routes anywhere. And they literally can’t even fit fully within our narrow lanes (the mirrors extend into the lanes beside them and if they’re even a hair off in their steering, they wind up straddling a lane or are at least driving on the line). Our buses are the same way, they have to straddle lanes everywhere they go, and the so called “Bus Lanes” just have cars parked in them, so they’re utterly useless. So yeah, filtering or lane splitting is just not safe up here. And hot whether is rare, so at least that part of it is of very little concern for riders. Staying warm and dry (especially) is the hard part here! I ride a lot and my thought is that I’d never do either, although it seems tempting. In general, if my bike stays idle for long, the fan does indeed kick in as it wants to overheat… not good. But in general, my thought is that I don’t want to drive anywhere I’m going to be stuck idling for long behind cars… Of course I have the luxury of choice. The smoke/exhaust thing is a bit more of an inner-city issue as putting a couple lengths between me and a car in front seems to do the trick. And if I’m in a city that dense, I wouldn’t want to ride a bike. In summary – I’m just not brave enough to split lanes – at least not on a regular basis. This strikes me as being similar to the helmet laws… it can go both ways and it’s a choice thing. The difference being that you could technically hurt someone else splitting a lane, not just yourself. Seems like a complex issue for sure. Rob – I’ve heard that most places either make filtering/splitting legal or they tolerate it. I see what you are saying about Vancouver. When it is unsafe, only people that are unsafe try it. The rest of us just try to breath shallowly. Vancouver doesn’t sound like a place I’d like to ride a bike. Neither does LA, SF, NY, HK, Rome, Cairo, or any of the other big cities for that matter. As for the guys smacking mirrors. Motorcyclists talk about that like it is a cool thing to do. I saw a t-shirt once that had a pic of a guy on a bike kicking off a side mirror with the caption, “If you aren’t using it, you don’t need it!” They don’t represent me any more than the person that will try to run someone off the road for cutting them off represents you. I wish they wouldn’t do it, that’s for sure, but assholes will be assholes. Eventually they’ll hit the pavement and that’ll be that. Clint – You have a much bigger bike and it has a fan. Many don’t so you just cook. Having the option to only ride when there is no traffic is nice. Even though I work from home, I still occasionally hit a jam. Personally, I get nervous at lights if I am not at the front. I’ve seen too many people change lanes the minute the traffic starts moving when they think they have space. I completely disagree about the helmet thing. There is no two ways. The choice is – risk dying because you don’t want to wear a helmet or not. I don’t see how you can have seatbelt laws and not helmet laws. I honestly cringe whenever I see someone without a decent amount of gear on. But that is for a later post.